In Colmar situated right in the heart of the historic district, the rent of a mansard-roofed holiday cottage of 49m² for 3 to 5 persons. This apartment is in the 2nd floor of a former half-timbered house. 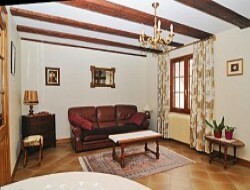 Holiday rental in the center of Mulhouse, in Alsace. Pleasant apartment for 1 to 3 people, not overlooked, with separate kitchen, large living room with bedroom area (separate twin beds or double bed), and lounge. 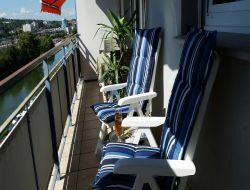 Terrace of 8m² equipped with a table, chairs and relax. Private parking with beep. 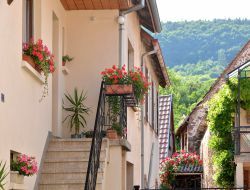 Holiday cottage situated to Eguisheim, historic Alsatian village, at the heart of the vineyard of Alsace. Independent house of 142m², being able to welcome from 2 to 8 people with 2 additional sleepings around. 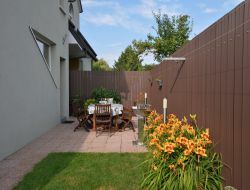 In the ground floor a living room, a fully-equipped kitchen, parental bedroom, privative shower-room. Terrace of 30 m ². In the 1st floor; 3 spacious bedrooms, shower-rooms and toilets independent. 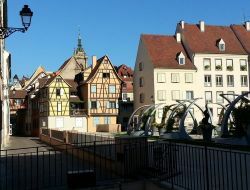 Holiday cottage for 4 to 6 people in Logelheim, near Colmar, Strasbourg and Germany. Vineyard and many tourist sites nearby. Rent of 2 gites for 4 persons situated at feet of the pass of Schlucht, in 5 km from Munster, 20km from Colmar. Soultzeren is a peace and relaxation place with his 2 mountain lakes as well as his ski resort. Nearby: Château du Haut-Koenigsbourg - Lac du Forlet - Station de Ski. 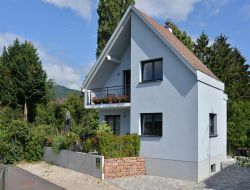 Welcome in our holiday cottage situated in Center Alsace. This gite is planned for 2 to 5 people: individual house, 3 bedrooms, 2 bathrooms, fully-equipped kitchen, covered terrace, privative courtyard and garden. 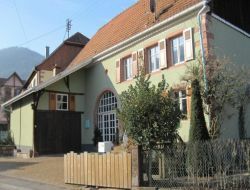 Rent of a holiday home in Breitenau in the Bas-Rhin, in Alsace, to have a pleasant stay in a small village in the middle of nature. Attractive independent, ideal country house to rest and close to the interest places of the region. Chalet surrounded by meadow with an outdoor spa enjoying a beautiful view of the surrounding nature, in a charming little village of Alsace, at 495 m altitude, in the upper valley of the bruche. Holiday rental close to nature and its many hiking trails and ski resorts, 2.5 km from the shops. Calm & serenity... you can go on a stroll without taking the car and enjoy beautiful and preserved mountain landscapes. You will be charmed by this gite of 55m² very bright, typical of Alsace with beamed, a bay window overlooking the castle and the slope of the Schlossberg. Cottage located on the 2nd floor of the house. Capacity: 2 persons.